More wet weather this week has helped the newly planted edible plants in the Annual Border establish themselves and saved BBG’s gardeners the trouble of doing much supplemental watering. Of course they’ve used the extra time to pull the weeds that also thrive in the rain. All in all, the season is off to a good start, and the cool-season vegetables in the raised beds and elsewhere are coming along nicely. 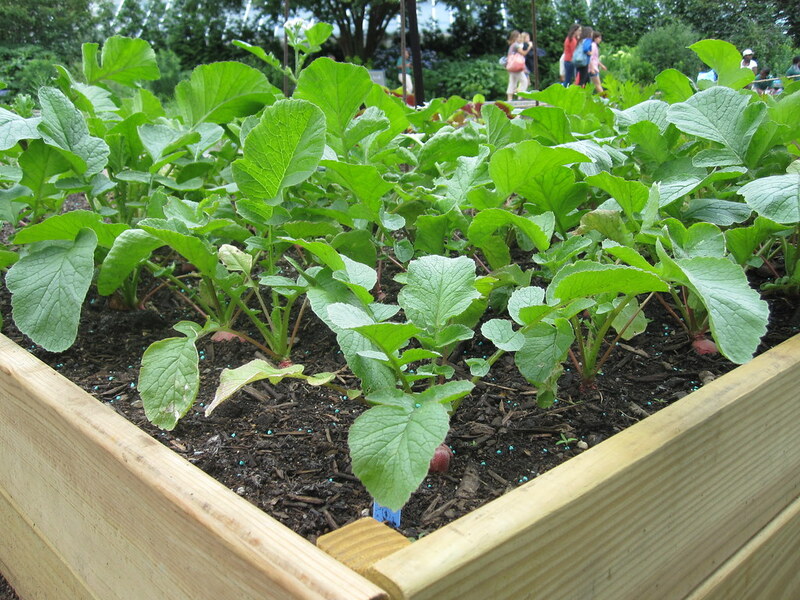 “The radishes look like they’ll be ready to harvest in couple of weeks. The kale, lettuces, and other greens are doing great, too,” says Cayleb Long, the Annual Border’s curator. Long says he’s already been able to pass along some herbs to the Terrace Café and plans to do the same with the first wave of veggies that he harvests. Then their spots will be given over to the next wave—warm-season crops like chile peppers. Radishes nearly ready to harvest. Photo by Sarah Schmidt.